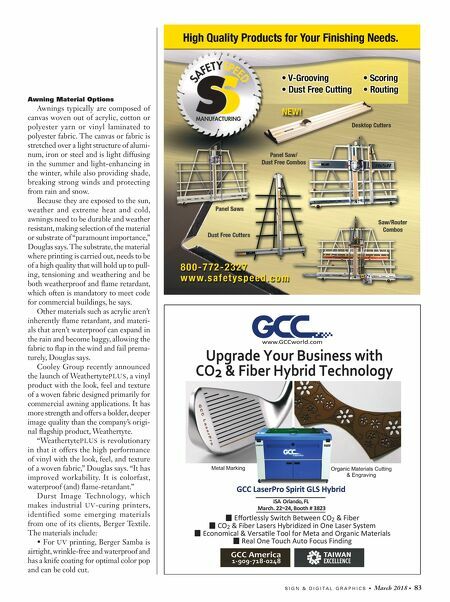 82 • March 2018 • S I G N & D I G I T A L G R A P H I C S ARCHITECTURAL AND ENVIRONMENTAL easily identifiable "landmark," says Peter Douglas, global sales account manager of Cooley Group, a Pawtucket, Rhode Island-based designer, developer and manufacturer of high-performance, sus- tainable industrial membranes. "Think of iconic retail brands such as TGI Fridays (red and white) and Panera's (no words and a symbol of wheat)," Douglas says. 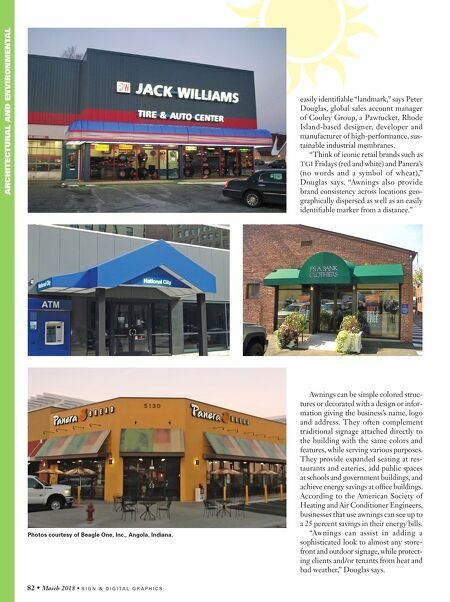 "Awnings also provide brand consistency across locations geo- graphically dispersed as well as an easily identifiable marker from a distance." Awnings can be simple colored struc- tures or decorated with a design or infor- mation giving the business's name, logo and address. They often complement traditional signage attached directly to the building with the same colors and features, while serving various purposes. They provide expanded seating at res- taurants and eateries, add public spaces at schools and government buildings, and achieve energy savings at office buildings. According to the American Society of Heating and Air Conditioner Engineers, businesses that use awnings can see up to a 25 percent savings in their energy bills. "Awnings can assist in adding a sophisticated look to almost any store- front and outdoor signage, while protect- ing clients and/or tenants from heat and bad weather," Douglas says. Photos courtesy of Beagle One, Inc., Angola, Indiana.